The easy way to get your caravan awning & trailer tent tight. Having used a Hercules tensioner before, I was rather sceptical as I found the Hercules fiddly to use. However, after using the Awning Companion my views have now changed!! We erected our Dorema awning and all the poles were in place but not tightened – so out came the Awning Companion to finish off the job of tensioning the poles. I could not believe how simple this device was to use, enabling one person to tension the awning. 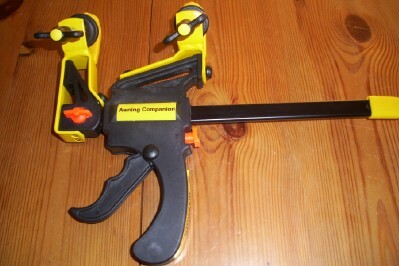 It has two pole clamps and is operated by a ratchet system to enable you to use it with one hand. You simply attach the it to the poles by tightening the thumb screws and then squeezing the trigger to tension the poles, then let go of it and tighten the pole. Loosen the thumb screws and place it on the next pole to be tensioned – it's that easy!! After tensioning the front poles (being careful not to over-tension because I have fibre-glass poles) I then proceeded to tension the roof poles, which was just as easy. Once fully tensioned, I pegged it down and stood back to admire my handiwork ! I truly have to admit that the awning had never looked so good – not a saggy bit in sight! Some of you may think that putting up an awning and just hand-tensioning the poles is sufficient, but there is nothing worse than one which is not tensioned properly and looks just saggy and droopy! Not only does it look bad, it can also be damaged if the weather gets wet and windy. All in all it is very easy to use (by one person) and if you want a safe and smart looking awning then this is a must-have piece of kit. After all, awnings are not cheap so buying this is well worth the investment. We thoroughly recommend it!!! 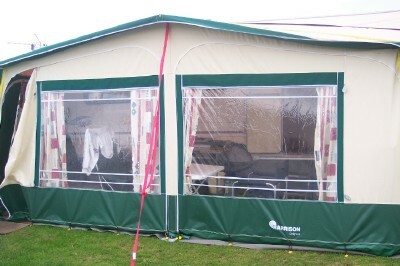 We have also given the Awning Companion to caravanners to test where we keep our caravan. We have not had a single piece of bad feedback about it - only comments such as "It is a great piece of equipment, especially if you are getting older and cannot grip so well" and "I can now tension the awning by myself without asking the wife to try and hold the poles steady!". What do you think of the Awning Companion? Click here to let us know.